2 A New Spam-Bot. Awesome. 6 Permanent protection for Lore:Gods? 9 Off With Their Head! 10 Sortable tables - aren't. Work slowly progresses towards another attempt at upgrading the wiki to v1.19. I've got another set of changes to test but the main issue is that I cannot replicate the previous issues. I've tried load testing an upgrade like crazy but it never shows the same issue. What I'm thinking of doing is instead of a complete upgrade attempt which turns the wiki read-only for a few hours in addition to some possible down time if it fails is to first deploy the change to one content server and see if the same issue shows up again. The downside of this is that some people will see an "old" version of a page in the 1.19 wiki. This shouldn't affect anonymous users much, if at all, but editors may be confused by having essentially two different wikis which may appear randomly. The effect will be temporary (under an hour, less if the same issue appears) before I revert top normal behaviour. I'm aiming to try this test tomorrow evening (I'll post an update here). If you go to the Obivion-Quests page and click on the (next 200) link it does not switch to the next page, it just goes to the "Pages in category "Oblivion-Quests" marker, and continues to display just the first 200 entries. The link looks correct, http://www.uesp.net/w/index.php?title=Category:Oblivion-Quests&pagefrom=Through+A+Nightmare%2C+Darkly#mw-pages, but it does not work. It has always worked before (at least it did about 2 months ago). Tried Firefox and IE, got same result with both. (Separate issue refactored out of original) To get floating text on edit summaries, try changing MediaWiki:Summary as below. <pre style="width:; white-space:-moz-pre-wrap; white-space:-pre-wrap; white-space:-o-pre-wrap; white-space:pre-wrap; word-wrap:break-word; "> Server error The website encountered an error while retrieving http://uesp.net/wiki/Main_Page. It may be down for maintenance or configured incorrectly. Here are some suggestions: Reload this webpage later. HTTP Error 500 (Internal Server Error): An unexpected condition was encountered while the server was attempting to fulfill the request. Spammers are both smart and stupid. Smart, as in they come up with new ways to spam, sometimes ways that we wouldn't have thought of ourselves. Stupid, as in they do it over and over again (as can be seen by Special:AbuseFilter/3 racking up over 2,000 hits in under a month), and as in they spam the same words and phrases. The filter is in most cases good enough, and is excellent for dealing with these kinds of situations (where spammers repeatedly spam a specific word or phrase). Should this somehow not work, however, I think it's a very bad idea to block talk page editing to existing users only. It is not in the wiki spirit to require people to create an account, and it's even less in the wiki spirit to require them to make ten edits before they can ask for help with a quest. It would do our site great harm to shut out anonymous users from asking for help, as that is one of the reasons why our site is so accessible - if you need help, you just ask for it, without logging into an account or registering an email or any of that crap. The user who posted and undid your post is not a mod--he doesn't have any special rights on the site, though he is in a special sort of user group. Anyone is allowed to undo your posts or post on your talk page. 95% of cases where a person posts in a dead conversation, it adds nothing to the wiki, but as you brought up some new points to a persistent issue, there is no problem with that. Everyone makes mistakes, though. We're not starving for data storage, no, but we like to avoid necroposts and idle chatter to keep the Recent Changes clean and the talk pages focused. Note: I typed up a very long and convincing proposal (around 3,000 words), but my browser crashed before I could hit Show Preview :/ I'm just going to keep this one short and sweet. The proposal is pretty simple. With Nephele gone and Daveh busy, we need another user with server access to help maintain the website. We've all worked hard, and the site is definitely in working order, but there are still some problems that direly need to be fixed. The search function is still broken, clear=none isn't working, and the site's CSS needs to be cleaned up. We still have a large amount of Outstanding Upgrade Issues that need to be fixed. There are a lot of things that can be added to the site as well, such as Hearthfire to CSList, and a Skyrim alchemy calculator (like the one we have for Oblivion). New problems will inevitably crop up in the future, and we need to prepare against those too. One or more users are promoted to a different user group which gives them server access, but does not make them admins. This decision will be interesting. With the first option, whoever was nominated would have to be both skilled enough to work with the server, yet also meet the strict requirements for adminship. With the second option, we'd have users with more power than admins, yet are not themselves admins, which seems rather silly. We then have to decide who to nominate. Personally, I think there are three people that meet the qualifications for this: RobinHood70, Alfwyn, and I. All three of us are patrollers, competent editors, and skilled programmers. However, I'll leave that part for later. (edit conflict) Just on a technical note, server access is a completely separate thing from any groups on the wiki. It would be silly, but there's no reason I'm aware of that we couldn't give Jimmy Wales server access, even though he doesn't have an account on our wiki (that I'm aware of). :) As Jak points out, though, anyone with full server access can make changes that even a Bureaucrat couldn't make, though I believe Daveh can limit access to only certain programs/areas of the servers (e.g., maintaining the CSList without having full access to the wiki files). Also, we need to keep in mind that even small changes on the server can potentially have far-reaching consequences. So, as far as who should be given this access, all three of the users mentioned have points both for and against us. The biggest one against all three of us, as far as I know, is that none of us has more than passing familiarity with PHP, which would limit our ability to figure out how to fix some of these issues. For myself, while I'm willing, I'm probably also going to be the slowest to figure my way around due to the CFS, which makes it harder to retain new information or to concentrate for lengthy periods of time. On the flip side, though, I have at least a tiny bit of prior experience with site management and the tools involved. Dave would still have to do a lot of coaching before I felt comfortable making more than minute changes, though. I am indeed planning to work full time on the site next year which means I'll be much more available for support and development than currently. This doesn't really eliminate the need for one or more admins as I still have vacation, I have to sleep sometimes, and there are still a good two months left in this year when I've be mostly unavailable. By "full access" I was meaning root which only I have and technically even I don't need root to do most of the work. Ideally there should be a few security levels available from shell access but the need and time required just has't been there. Avron from the forums does have shell access although her work is limited to the specifically the forums. Whom ever does get access doesn't necessarily need to be a shell/Linux guru as I don't mind people learning on the job (it is basically what I do anyways). On the other hand, having some more knowledgeable than me would be nice as well as they can point out areas that need improvement. The biggest challenge in granting shell access is that you can very easily break the site. This should be readily apparent by the number of times I've broken things despite basically knowing what I'm doing and specifically not trying to break it. Part of this is better documentation (or actually documentation) on the site setup and the other part having a more robust site design (harder to do but everything can be improved). Most the upgrade issues and other work that needs to be done is just software development. We sort of have a development environment setup on content3 which makes it easy to test things without breaking the site for everyone. We can easily setup one or more people to work on content3 and have the finished/tested changes deployed to content1/2 by myself or whom ever the new shell access is given to. I'm glad to hear that you'll be able to work full-time on the site - we all love being able to interact with the webmaster of this site, and having you here full time will be very nice. I don't think any of us would need root access - mostly just being able to change PHP files, configuration files, installing extensions, updating CSList, and the like. Using content3 as a test bed is a good idea. In addition, my desktop computer has Google Chrome, and one neat thing about it is that you can select an element on the web page and edit it, including any source files, and immediately see the results, allowing for quick testing. RobinHood70 has some experience working with databases, but his main qualification is that he has a bot that's just about ready to be able to upload directly to CSList. He's also a long-time user of the site and well-trusted, and I'm confident that he'd safely use any new powers. Alfwyn is an actual programmer (and the most skilled of us three), so he'd be able to pick up on the new programming language quite quickly, and expertly modify and create files. If only one of us received server access, then Alfwyn would probably be the best candidate. I am the least skilled overall, but (although I really hate to toot my own horn) I learn really, really fast. In addition, because I only have 3 hours of classes per day, and homework only two days of the week, I'd also be the most available. I suspect that if it came to a vote, people would vote in that order. If we decided that two people were best, and I was left out, then that's okay. The site's needs come before mine, and if the community decides that it's for the best, then I'll go along with it. Just want to say I appreciate all three of you identified so far, for being interested in contributing at a deeper level, applying your skills, and (where relevant) learning more. To mention just one of the reasons raised above calling for one or more additional people to have shell access, and one or more to have content3 development environment access, I think that just having as useful a search utility as possible, as fast as possible, will likely prevent some people from turning away from the site. I'm sure that most people who appreciate the unique strengths of our wiki won't just abandon us, but I can also imagine a significant number of people who feel even a tad frustrated with finding what they're looking for turning elsewhere quite quickly. It may be hard for those of us who love the wiki to see that, but I feel its a serious risk. I'd hate to see that happen. I expect that if more than one of us is given shell access, we'll quickly split off based on our various pre-existing skills, though I think each of us would still have a lot to learn even within the areas where we have some skills already. In my ideal world, I'd like to focus on CS List and leave the PHP programming (i.e., things like the search functionality, fixing the icon clear parameter, etc.) to Alfwyn and/or Jak. If Dave would rather see only one person there and if I end up being that person, then I would prioritize the programming over CS List, I think. Also, I should clarify that while I think I'm close to being able to upload data to CS List, a lot depends on how Nephele designed it as well. I can make educated guesses just based on what I'm seeing on-screen, but I could be completely wrong, in which case it could take a lot longer. I'll be in a better position to judge if/when I get a look at it. I think JR makes an important point. Having access to the database one could emulate admin activities, but it should not be done. I believe that shell access and the admin role can be separated, and documenting changes done, like Daveh does even now, will be important. This process gives the prospective users more rights than anyone on the site, so while in the end, it's ultimately Dave's call, as only he can grant these permissions, I'd still like there to be some kind of community procedure involved. It's just nice to be able to think that each user is someone the community respects and knows will handle the power responsibly, rather than random users who say "Dave, these are my creds, may I have server access?" In this case, I don’t believe in a public nomination. I have been an administrator for three years and I don’t have a clue what server access is, yet, if we put these three persons up for a vote, it will inevitably end up as an RfA, warts and all – simply because people don’t know what they’re voting for. I’m not saying everybody is as stupid as me, I’m saying that some decisions are too important for the rambling community. We are running one of the biggest gaming sites on the web and this should be up to Daveh as they WILL be his responsibility in the end. There’s a HUGE difference between administrator duties (now more than ever, actually) and technical maintenance and it’s overly important that we find the right persons for the job. I’d back up RH70, Alfyn and Jak for this task any day of the week, but a public nom wouldn’t benefit the community at all, for the above-mentioned reasons. There’s a huge chance a nomination will turn ugly, with the three nominees defending their previous Wiki actions endlessly, with someone who has no idea what they’re voting for. Krusty, you make some good points, however, I am still preferential to at least some kind of Q&A, at minimum before users are granted server access. Granted, this kind of request has only happened once in the past, so there isn't a lot of precedent to follow, but in the spirit of the wiki, as Jak always likes to put it, we should allow at least minimal feedback on the issue so that the site's users know what's going on. This is a community driven site, so we need some kind of transparency. I agree that a nomination process wouldn't be compatible with this particular request, but the Q&A aspect of the RfA process should be carried over in order to get to know what the user has in store for the future with their rights. Transparency helps ensure honesty, as everyone would know what to expect. They are, effectively, being granted super-admin rights, so they need to be users of the highest standing with the wiki community. Lastly, the wiki is run on consensus, and while this isn't exactly an issue that can easily just fall to consensus, it still feels almost elitist to only consult a small percentage of the active user base over what needs to be done, which is why I feel like discussing each user's different aspects via an email, as you suggested above, is not proper. It goes against what the community as a whole is. We have plenty of regularly active users who don't have rights and have been around to know what's going on, and simply by that standard, would immediately be excluded from discussing a major change for the site. As I said above, I can see the argument for this to be between Dave and the three nominees, and honestly, it's a borderline thing for me. In some sense, it's very much like hiring new employees. On Wikipedia, it's done at the board of trustees level, whether the sysadmin is a volunteer or paid, and there's no public involvement. Similarly, on another social networking site I'm on, the job is advertised to the membership, it's conducted purely as a hiring process, and then the membership is informed afterwards of who was hired (who has not always been a previous member...sometimes it's been an outsider). Then again, it is a paid job there, so that's to be expected. That said, we've previously done this as a public nomination, and in general, I believe that decisions on a wiki should remain public. If we want to make this Dave's decision only, I won't complain, but if anyone other than Dave is to have a say, then I think discussion should be public and transparent. If it's felt that regular users don't have sufficient knowledge or what have you, then we can always restrict comments to patrollers and admins, long-time users, technically knowledgeable users, or whatever else is deemed appropriate. I don't think it necessarily needs to be at the level of a full RfA, though I'm not sure how else to approach it. I think questions, if any, should revolve around technical knowledge and trustworthiness, though it can be difficult to demonstrate either without posting an entire CV/life story, which I think is overkill. Separate Q&As or nominations, if any, make sense to me because otherwise, it's too easy to gloss over issues that should be raised when you're talking about a group rather than individuals. On the other hand, nobody so far has said "no, I don't think <username> should have access", so perhaps the above discussion is all that's really necessary and Daveh should just make the decision? Gah...I'm so confused! I've given this matter a lot of thought (given that it's taken two weeks), and I've come to the conclusion that Daveh should make this decision on his own. I'm a huge proponent for the Socratic community, in which everyone has a say in everything, but this situation has no precedent. It is entirely based on maintaining the website itself, and is entirely outside of the community . The critical point is, though, that if it came to a vote, nobody would know what to vote for. Programming skill is subjective - we're all equally skilled at what we'd have to do to fix the website. Strength of character and dedication to the website also aren't problems - otherwise we wouldn't be here right now, offering to do this work for free. It ultimately comes down to what Daveh decides, so I say we just simply let him make the decision. It may seem less important now, considering that there is only one month left in the year, but these new rights are long-term. With them, we can repair the site and maintain it, and also add to it, by updating CSList, creating a Skyrim alchemy calculator, and adding various extensions. I essentially agree with Jak, but I don't much care how it happens. I just hope it happens, for the reasons laid out at the outset of the discussion. This strikes me as appropriately being Daveh deciding who can/should help him with certain tasks that he is doing himself now. I don't see any problem with him asking for input, "publicly" or privately, if he wants it. Nor do I see anything wrong with people sharing thoughts or concerns, especially given that a certain level of trust and responsibility is called-for. I think Daveh can decide who he feels comfortable with. I guess he faces consequences at least as serious as any of us if Jak and/or whoever, has been secretly biding their time to get their hands on the server and destroy the wiki, and we have failed to uncover his criminal record as the creator of the MyDoom worm because someone who knew didn't get a chance to share their information on that. I have three questions to ask about Special:AbuseFilter. I recently set up the Targeted Spam Filter to block the "Very nice site" spammers. If you find any "Very nice site" spammers get through the filter, any at all, please post a link to the edit so I can see it. I want the filter to block 100% of this spam. I don't mind so much if a couple of other spam edits get through, but I really want to block all of the "Very nice site" spam. It's been a nuisance to our site for who knows how long, and I'd like to see all of it gone. AbuseFilter has been having problems detecting hyperlinks. For instance, anything beginning with HTTP (in all caps) is not being detected, and numerous other links are getting through the filter. Judging by the related Community Portal topic, there is a major software error going on. Daveh, can you possibly take a look at this? It's already set up to warn the user, and if they try again, to disallow it. The problem is, after their edit is disallowed, they just try again. Many spammers will make 20+ edits before one of them manages to get past the filters. It would make much more sense to block them before they manage to successfully spam. Although I'd normally agree with you, the fact that the filter has been triggered over 4,000 times without a single false-positive is pretty indicative that this isn't going to be a problem. However, I could also set up a new filter, called "Lethal Spamming Filter", that warns then blocks users who use words that are irrefutably spam words (such as "Louis Vuitton"), yet leave potentially ambiguous words (such as "jersey") to only be warned then disallowed. Firstly, I'd like to mention that the default maximum time a blocker can block is only 3 hours, which is hardly enough time for an admin to get on and change it. I'd like more time for blocks. Technically, it's 4 hours, but 3 hours is one of the default choices for blocking, so that's what we usually select. You can always type in "4 hours" if you want to make it just that much longer. Remember that you can re-block if necessary. Also, keep in mind that when blocker rights were first set up, it was intended that they be given out to any long-term editor if an admin wasn't around on an "easy come, easy go" basis. In regards to the maximum block length available to blockers, I did have a situation on Nov. 17 where I had to reblock someone three and a half hours after I blocked them the first time. That's rarely a concern, in my experience, and Krusty took care of it mere minutes later. But it might be better to give blockers a block time of five or six hours so admins have ample time to take any necessary further action and to better deter offenders like that who may try to wait out their block. At the very least, adjusting the default choices to include "4 hours" would be helpful. (←) I agree that we do not need to extend blocker rights to all patrollers. We currently have six rather active ones, filling out the ranks will not add much benefit as the UESP almost always has eyes on it that can block now. More importantly, vandalism isn't that huge of an issue right now. Take a look at the block log, you'll see that blocks for vandalism are rather rare. The primary target for blocking right now are spammers, the one kind of issue that blocker rights simply won't due that much to help with. While I would definitely consider any active patroller for blocker rights (it is already pretty much a guarantee that you'll get them if you're already a patroller) if they would request them, I don't think there is any need for conscription when vandalism isn't that much of a problem right now. I think the points made about making active patrollers into blockers automatically (or even after a 30 day waiting period) are good ones, and agree that this isn't really a good route to take for those reasons. Anyone can request to become a blocker at any time, and an administrator can grant those rights if they see fit. Nothing needs to change in that regard. I clicked on the Random Page button, only to be returned with this message "Sorry! This site is experiencing technical difficulties. Note that their indexes of our content may be out of date." Semi-protect articles in the Skyrim namespace. This protection is intended to avoid people adding content to the incorrect pages in the Skyrim namespace. 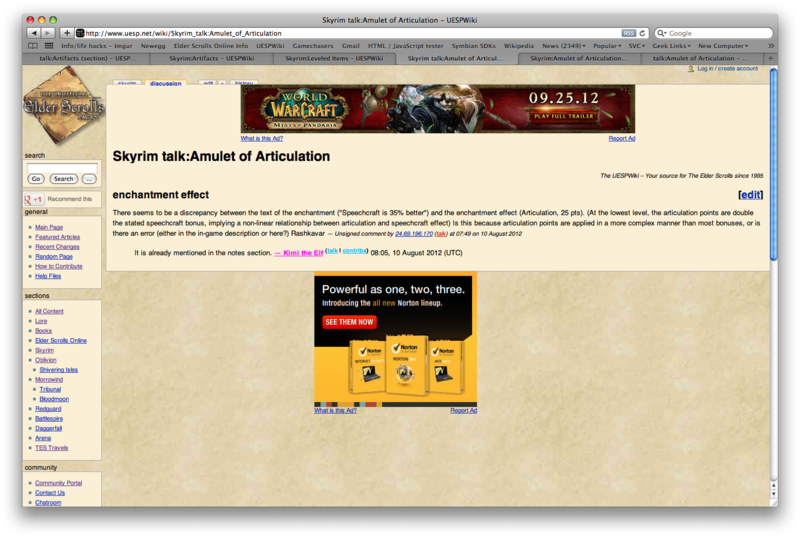 As an example, this protection will stop users from adding new items to Skyrim:Artifacts as they should go on a Dragonborn version of that article (reminds me that we never set up a SI Artifacts article, now that I think about it). The only problem is that we'll have to stay on top of updating the Skyrim namespace with relevant links, where appropriate (as in, linking to the Dragonborn Artifacts page from the Skyrim Artifacts page). While I'm unsure of when to unprotect the Skyrim namespace, a week or a fortnight should do with any luck. Block page creation in the Skyrim namespace. This is to direct people towards the Dragonborn namespace, should they accidentally try to add to the articles in wrong place. With this move, we can cut out accidental edits in the Skyrim namespace almost entirely. It'll be one less issue to deal with on release day. Skyrim should be protected immediately, with the page creation protection for the Skyrim namespace ending with the Dragonborn namespace's protection (see below). Just for reference, this is what we did for Skyrim's release. We'll just be doing that, minus the other namespaces being protected. MediaWiki:Titleblacklist-otherns should also be updated. The Dragonborn namespace is to be left open to page creation initially. As this is another expansion being released on the Xbox first, (What, did Beth forget to get Microsoft a holiday present, and they decided to give them another period of exclusivity for their next expansion as a last minute gift?!?) our ability to create pages will not be as automated as it will be in the past. This once again means that the hardest and earliest work is going to fall to the Xbox players out there, sadly. Once we feel that all necessary pages have been created, the Dragonborn namespace will be locked. The purpose is to avoid duplicate articles on the same topic, and avoid pages on irrelevant or unimportant topics from being made. While it's a bit unclear of when we'll need to lock this namespace, hopefully it'll be able to be closed to page creation within a week or two. I can't see it not being done by the new year, at the most. Support to all of the above pages. Would something be appropriate for lore, since the above tweak from Nephele last year mentions it? Granted, several pages already exist, like Lore:Solstheim, Lore:Raven Rock, etc, so it's not quite so urgent, but there's always the few helpful anons who like to try sticking game related material in there. I hope, and would like to imagine, that nothing would need doing there, but as a first thought, something related to Lore might not hurt, so that our lore writers would have a little more room to maneuver without a mess happening. Even without playing (or even intending to play it), several Lore-relevant articles already appear necessary, like the new Dunmer settlements, the other Dragonborn (Mirak(sp?) can't bother to look) all will undoubtedly need work done in that space. Esta página foi modificada pela última vez à(s) 00h55min de 9 de fevereiro de 2014.